Someone expressing her love for TOR, because it saves lives in Turkey. On Saturday, 14 February 2015, people all over the world showed Free Software contributors their appreciation. 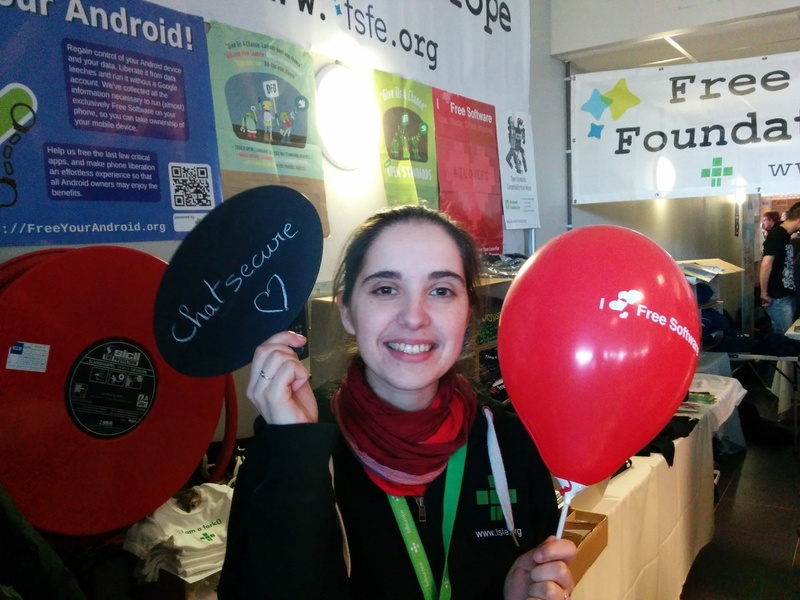 It was the fifth year the Free Software Foundation Europe (FSFE) asked people to participate in the “I Love Free Software” day. This report shows a variety of love declarations that happened this day, including blog posts, pictures, comics, poems, and an #ilovefs Android library. The FSFE thanks everybody who motivated Free Software contributors this year, and ask everybody to mark 14 February in their calendars for next year's “I love Free Software” day. This year many people focused their activities on -- what FSFE's president Karsten Gerloff described as -- “powerful tools that help us defend and regain the freedoms we’ve lost, and the ones we’ve given up”: Our sister organisation encouraged people to ask someone they like -- romantically or otherwise -- to be their “cryptovalentine”. 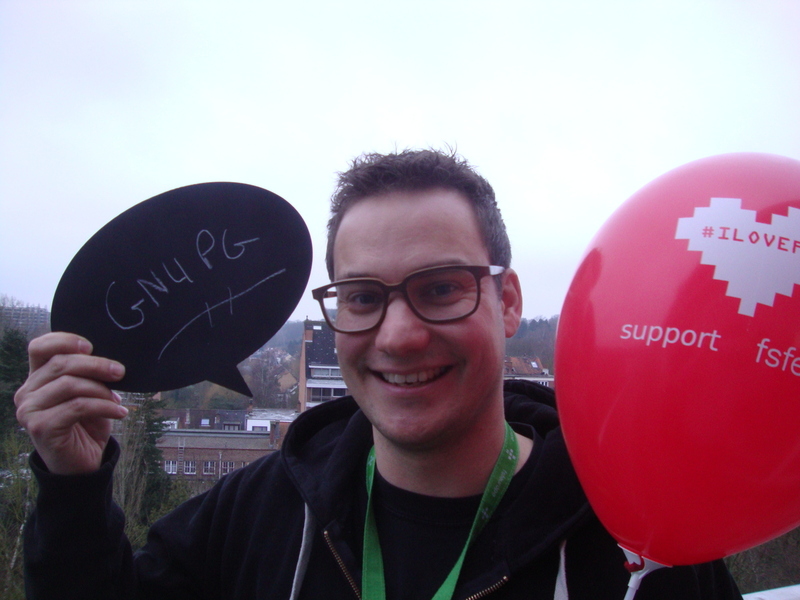 André Ockers, FSFE's vice president Matthias Kirschner, and many people in our photo gallery expressed their appreciation to all the hardworking Free Software contributors who work for our privacy like GnuPG, Tor, Tails, Chatsecure and many others. "Thanks to all those who do not contribute to free software projects but who work on this by political intervention, campaigning, activism! We can’t win this by just developing free software. But we can’t win it without free software either." Roses are red. Handles are green. You’re the finest diagramming software I have ever seen. Always there to help me out. And you ask nothing in return. Creating things together is all I really yearn. Dia I know we will be a great team. We can work together even upstream. There was a huge amount of messages in social networks, people expressed their love in pictures (e.g. in our gallery, or by members of the Vignate GNU/Linux user group), posters were created (e.g. by Linda Martinez), the Document Foundation themed their bug tracker, and Anatolij Zelenin wrote an Android I love Free Software Day library which is already included in the Android app Mirakel. Like in the last years we had many organisations and individuals thanking Free Software contributors in articles. Beside the others mentioned before, for example Dario Tordoni thanked the F-Droid developers, Jens Leuchtenbörger wrote why he loves learning vocabulary with AnkiDroid in combination with QuickDi, and Max Mehl thanked the contributors of Taskwarrior, command-line task-management tool. We were happy to see many organisations expressing their love in other languages than English, for example: Framasoft (in French), Wikimedia Germany (in German), KDE Spain (in Spanish) the German Green Party (in German), which also announced that they will soon hand in a parliamentary enquiry about Free Software. Mark the date for next year! Comic strip “J’aime le logiciel libre” in French by Grise Bouille.